Nice family vehicle. Easy to get in and go. No major issues other then normal wear and tear from being drove around. Have had to replace the exhaust line, brakes, rotors, air filter, oil change. Also have to replace the suspension, spark plugs and wires, thermostat and sway bar assembly. Have the normal wear on the power windows. Sometimes they work and sometimes they don't. Might have to replace the switches. Also have a power sliding side door. Which is really nice with kids. Makes getting in and out a lot easier as it also has the safety feature so it wont open if the car isn't in park. And it wont close if there is anything in the doorway. My 2005 Chevy venture for you. Vehicle has plenty of room for all the kids and plus extra room for storage. Windshield is huge so it's extremely easy to see there it. doesn't not go up hills very well but could be from being so old. 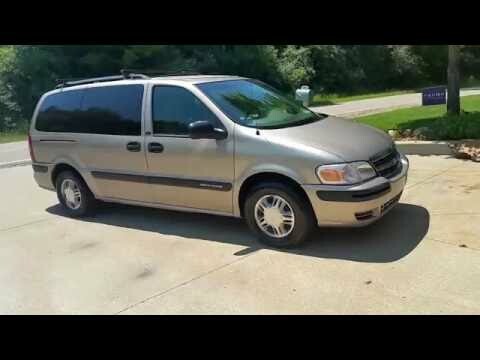 I really like the van but could use a newer gen van. The heat is amazing I turn it on and not even 3 mins later it's nice and toasty in there. Seats fold down for more cargo space. No room to put anything in the cargo area. Drives ok. Very hard on braking system. Needs better armrest. There needs to be more windows that open up other then the drivers and passenger. White is a bad color for these vans. Kids like the van they just miss the TV's in the van. The van I bought was just basics.